This is a great, really interesting machine. It’s a semi-automatic, but has a lot of features you normally only find in a super automatic. Combine that with its modest price, and there’s a lot to like here. Recommended for: Singles. Small households with only one coffee drinker. Purists may find it too minimalist for their liking, and it’s too small for power drinkers. Are you single or living in a small household where you’re the only coffee drinker? Are you tired of drip brew coffee and looking for something that offers enough flexibility and capability to allow you to create a wide variety of coffee shop specialty creations? 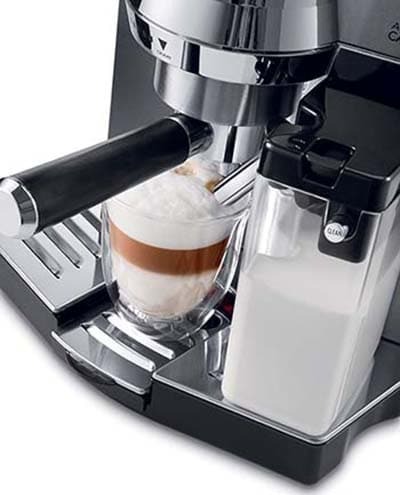 If so, then you’re going to love our detailed DeLonghi EC860 review. It’s by no means a perfect machine, and it does have some limitations, but honestly, it represents a tremendous value for the money, and if you’re new to the world of specialty coffee drinks, it’s a great starter machine. As you’ll see in the sections that follow, it’s not at all typical of semi-automatic machines, filled with features that you normally find only on the more expensive super autos. That’s both a good and a bad thing. Coffee purists will probably be put off by some of the convenience features and loss of control, but again, it makes it an extremely newbie friendly model. The first thing you’ll notice about the DeLonghi EC860 Dedica 15 bar pump espresso & cappuccino machine is its diminutive size. It measures just 10.6” x 12.2” x 12” and weighs a scant 15.4 pounds. At that size and weight, it’s small enough that you won’t have any trouble finding a permanent home for this machine, even if you’ve got a smallish kitchen and counter space is at a premium. It’s a good-looking, if somewhat understated machine, with a thin outer layer of brushed stainless steel on the front face and sides, and a metal top. Note that the casing isn’t as thick or durable as some other semi-automatics, which explains why this unit is so lightweight compared to say, a comparable machine made by Quick Mill. While it’s not quite as durable as those top-end models, with proper care, it will serve you well, and provide thousands of cups of your favorite specialty drinks. This is a tremendously important part of our DeLonghi EC860 Dedica review. We’re power drinkers, and guzzle a lot of coffee throughout the course of any given day, so for us, the bigger the water tank, the better. Unfortunately, in this regard, the EC860 came up a bit short. While its 35-ounce, front loading water tank is fine for individual users, and people who aren’t power drinkers, this machine just doesn’t have the capacity to keep pace with a house full of rabid coffee aficionados or power drinkers. If you’re the kind of person who enjoys a couple of cups in the morning before starting your day, and a couple more after work, then it’s perfect for you, but if you drink a lot of the stuff and spend most of the day with a coffee cup in your hand, then you’re going to be somewhat disappointed by the capacity of the tank, and will have to spend a lot of time refilling it. When you buy the machine, you’ll also get a water filter. It’s up to you whether to use it or not, and there are pros and cons associated with each. On the one hand, using the filter will slightly decrease the capacity of the already smallish water tank. Not by a lot, but since the reservoir is already quite small every ounce matters. The upshot is that using the filter will mean that you almost never have to descale your machine, so it cuts down on maintenance. On the other hand, though, filters are expensive, and only last about a month before they need to be replaced. At $20-$25 a month, that adds up quickly, and over time, will significantly increase your total cost of ownership. There are a couple of ways you can have the best of both worlds. For example, if you already have a water filter on your kitchen sink, then you won’t need one in your tank anyway. If you don’t, you can use distilled water in your machine and accomplish the same thing. In any case, the key thing to remember about this feature is the fact that the tank is quite small, making this model a relatively poor choice for larger households or power drinkers. This will be a short section, because the DeLonghi EC860 Dedica is a semi-automatic machine, and there are almost no semis that incorporate one into their design. That’s not necessarily a bad thing though because, from a practical standpoint, it means you can get exactly the grinder you want. In fact, one of the chief complaints you hear about super automatics is that the grinders are a bit lacking. Sometimes, it comes down to not having enough grind settings, and others, it’s a matter of being the wrong type of grinder for you, but whatever the case, you just wind up having to live with whatever the manufacturer decides to include in the machine. Of course, you don’t have to use a grinder if you don’t want to, but that almost defeats the purpose of getting an espresso machine. If you plan on using pre-ground coffee exclusively, then you’re probably better off just sticking with a top-quality drip brew machine. Steer clear of blade grinders. While they produce coffee grounds that are better than what you get by using pre-ground, the grind tends to be highly inconsistent. Besides, it doesn’t make much sense to spend hundreds of dollars on a great coffee machine, only to pair it with a ten-dollar grinder. Steer clear of stainless steel grinders. They work well, but also, they tend to overheat after repeated use. Overheating will burn your grounds, which will ruin the flavor of whatever drink you’re planning on making. Not good. 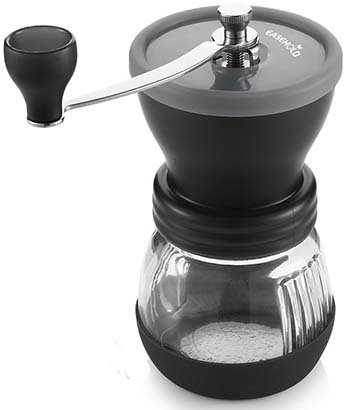 Your best bet is to get a good, ceramic conical burr grinder. Don’t skimp on this. Getting the grind right is a pivotal piece of brewing a great cup of coffee, so get as good a grinder as your budget will allow for. You’ll be glad you did! It probably won’t surprise you to hear that the DeLonghi Dedica Cappuccino EC 860 only has a single boiler. At the price point, the EC860 is offered, it would be too much to expect to find a second boiler inside the unit. The one boiler the unit has is excellent, being fashioned of aluminum and lined with stainless steel, and incorporating Thermoblock technology which allows it to rapidly change temperature. From a practical standpoint, what it means to you is that it’s going to take a little longer to make a milk-based drink because the one boiler needs a bit of time to shift gears and change temperatures from brewing mode to milk steaming mode. The extra time is measured in seconds, rather than minutes though, and given what we mentioned earlier about the size of the water reservoir and the kind of user this model is designed for, it should not be a deal bre​aker for casual coffee drinkers. There’s more to this section than first meets the eye. 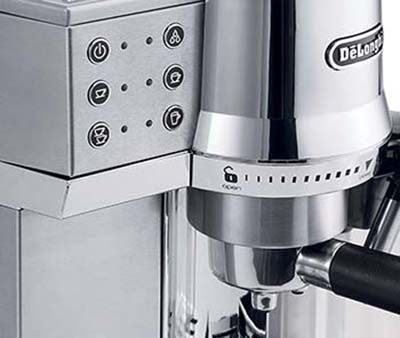 As a semi-automatic machine, the De Longhi EC860 Dedica doesn’t have a telescoping spigot. To brew coffee, you’ll be making use of a portafilter, filling it with fresh ground coffee, tamping it, inserting it into the machine, and then pressing the brew button for the drink you want. When you make your purchase, you get a single portafilter with three baskets. One for a single shot, one for a double shot, and one that will accept coffee pods. This last is especially significant because most specialty coffee makers don’t accept pods and the ones that do almost always accept pods exclusively, so there’s no crossover. That’s just one of the things that make this such an impressive machine. What this means for you as a potential buyer is, if you bought a Keurig or similar pod-based machine sometime earlier and are feeling constrained by it, this is a good transition machine. It allows you to keep enjoying your favorite coffee, tea, or hot chocolate pods, while simultaneously giving you the flexibility to branch out. It’s the best of both worlds! Note too that the filter baskets are pressurized. What this means for you is that the baskets only have one tiny hole in the bottom which allows the coffee to flow through. That’s what increases the pressure, and it’ll help you produce a richer, more flavorful cup of whatever drink you’re brewing. There’s not much to say here because the EC860 is a lesson in simplicity. The brew unit is not removable, which means that you’ll need to backflush the system about once a week to keep it clean. The control system is equally simple. There’s no LED, LCD, or TTF (Thin Film Transistor) interface, and only seven buttons overall, including the power button. These are programmable, but only to a degree. You can set the water level for a single or a double shot of espresso, and control the milk volume for a single or double sized shot. You can also set the boiler temperature through three levels (low, medium and high), and adjust the auto-shutoff timer, selecting from one of three options: 15 minutes, 75 minutes, or three hours. Since the operation is streamlined and simplistic, it won’t take much effort to master the basic operation of the unit. Of course, the downside here is that you don’t get advanced options as you do in more expensive models. You won’t find user profiles or pre-programmed, one-touch drinks here, but that’s not really what this machine is all about anyway. Before we talk about the pump strength, we have to say a few words about the difference between drip brew coffee and how espresso is made. Drip brew machines rely on the simple power of gravity to convey the coffee from the brewing chamber to the cup or pot waiting below. Espresso machines use pressure, and pressure is measured in bars, with one bar being equal to atmospheric pressure at sea level. It takes nine bars of pressure to make a good espresso, and the EC860’s pump is rated at fifteen bars. It’s got all the power you need to make a world-class cup of espresso, every time you use it, and that’s just awesome. 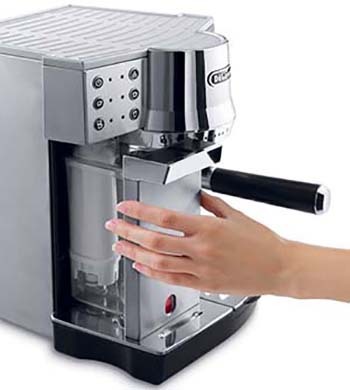 This is probably the most important part of our Dedica EC860 review, and DeLonghi did an exceptional job here. There are two basic ways that a machine can handle milk frothing: An auto-frother or a steam wand. People who are new to the world of specialty coffee drinks tend to prefer using an auto-frother because it’s simple and convenient. You pour milk into a carafe, plug it into the machine, and it creates milk foam for you. Steam wands tend to be preferred by coffee purists and those who are looking to burnish their Barista skills. It takes a bit of practice to use a steam wand well, and you can count on the first few milk-based drinks you make not turning out quite as you’d hoped. Once you get the hang of it though, you can get exactly the level and consistency of froth you want, and you can dial in the milk temperature so that it’s just the way you want it. The great thing about the EC860, and in our view, the strongest feature of the model is the fact that it offers both options. You get an auto-frother and a conventional steam wand. Both are quite good, but our opinion is that the auto-frother is the better of the two. 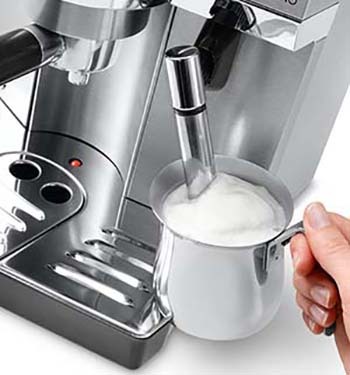 It produces good quality milk foam and has two settings: one for cappuccino and one for lattes. The latte setting produces steamed milk (very little foam) while the cappuccino setting produces foam of good, but not exceptional quality that should be sufficient for most casual coffee drinkers. The steam wand is good but has a problem. It’s extremely short. That’s going to increase the learning curve somewhat and make it a little harder to master, but once you get used to using it, you can produce world-class milk foam. Despite the problem with the shortish steam wand, this is one of the very few machines on the market today that offers you both options, and that makes it truly exceptional. 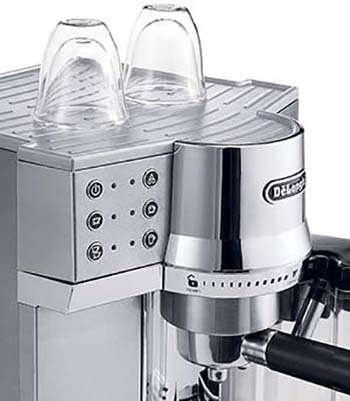 This is another important part of our DeLonghi EC860 Dedica pump espresso coffee machine review. If you’re new to the world of specialty coffee, you may not fully appreciate how critical the cup warming tray is. It’s the unsung hero in the world of specialty coffee drinks. These kinds of drinks are meant to be enjoyed at temperatures somewhat lower than most Americans drink their coffee, and the problem is even worse where milk-based drinks are concerned. If you brew your drink into a cold cup, the heat loss will inevitably make things even worse, and that’s the problem that the cup warming tray solves. 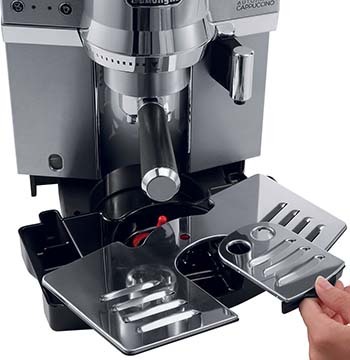 The DeLonghi EC860 does an outstanding job on this front. 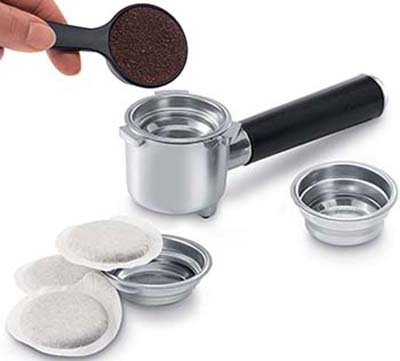 Most espresso machines that offer a cup warming tray use passive heating, which simply means that the heat from the boiler also warms the tray. This unit has an actively heated tray, which means it’s got a dedicated heating element to provide heat to the cups. That’s significant because passively heated warming trays don’t get nearly as hot. It makes a bigger difference than you might think. If you have doubts, make two of your favorite drinks, dispensing one into a cold cup, and one into one that’s been sitting on the warming tray for a while. You’ll be amazed at the difference! 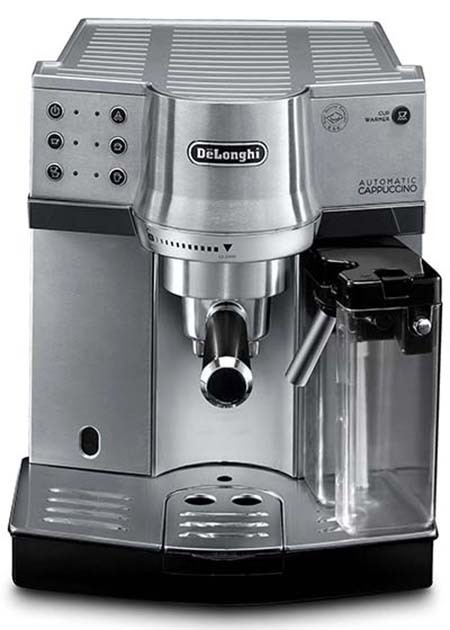 You may have seen some DeLonghi Dedica EC860m reviews online and wondered what the differences are between the “M” variant and the core model. We don’t recommend the EC860M, because while you gain one programmable coffee button, the “M” variant doesn’t have a preinfusion feature, and in our view, makes a decidedly inferior cup of coffee because of it. Because of that, we’ve discounted this variant, and our review is built around the core model. This is a small but important part of our DeLonghi Dedica EC860 review, and there’s a lot to like here. 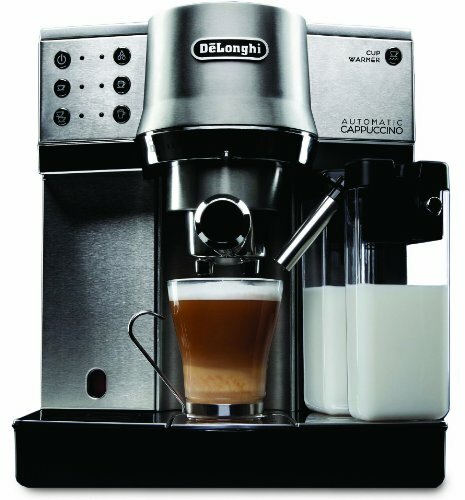 DeLonghi does an excellent job making it easy to keep the machines they make clean, and the EC860 is no exception. Not only do you get descaling agent in the “goody box” when you make your purchase, but the auto-frother that comes with the machine has a handy cleaning feature built right onto it. After each milk-based drink you make using the auto-frother, just hit the cleaning button built onto the front of the carafe and give it a good rinse. Easy as pie! The other maintenance items you’ll need to attend to are keeping the drip tray empty and back-flushing the machine about once a week. Back-flushing is, to a semi-automatic, what washing the brew unit is to a super automatic. Just put in some cleansing agent and cycle the pump a few times to get it worked into the brew unit, and you’re all set! In addition to that, the EC860 is super simple to operate. With a minimalist control system and only a few buttons to contend with, there’s no learning curve to speak of here. It will probably take you longer to set the machine up than it will be to master its use. Kudos to DeLonghi! The only major downside is the fact that it’s got a really small water tank. For us, that’s a deal breaker, but we understand that it probably won’t be for many potential purchasers. Some users have also complained that the steam wand is a bit too short to use effectively. It’s possible, but it does take a bit of finesse. Other than that though, we have to admit that although this machine isn’t for us, it’s a great little unit. And that wraps up our DeLonghi EC860 review. As you can see, there’s a lot to like about the machine, despite its imperfections. If you keep those limitations in mind when making your purchase, you’ll love it, but ignore them at your peril. If you consume vast quantities of coffee, or if you’re looking for a machine that gives you vast customization options, then this isn’t the one you want. On the other hand, if you want a robust starter machine with enough capability to allow you to make all your favorite drinks, and you don’t mind doing a little bit of the work yourself (and you don’t drink a ton of coffee during the course of a typical day), then this is an excellent choice, and is highly recommended. Coffee Grind Size: Why It Matters and What You Should Be Using. CNET. Milk Foam: Creating Texture and Stability. SCA News. Why Is Freshly Ground Coffee Better. Alternative Brewing.